L400 UHV sputtering system is a unique deposition system for sequential sputtering. The system feautures a cryopumped UHV linear chamber in which six magnetron cathodes are arranged along a movable arm that is translated back and forth to sequentially deposit layered films on a substrate (up to three RF magnetrons and three DC/pulsed DC magnetrons). The substrate position has four shutters which can be positioned to confine the deposition area by shadowing. The computer controlled shutters can be moved during the deposition to create wedge-shaped thickness gradients across the substrate. The chamber has a substrate manipulator which can be RF or DC biased , heated up to 1000°C and can have a magnetic field imposed at the substrate plane during deposition or annealing. 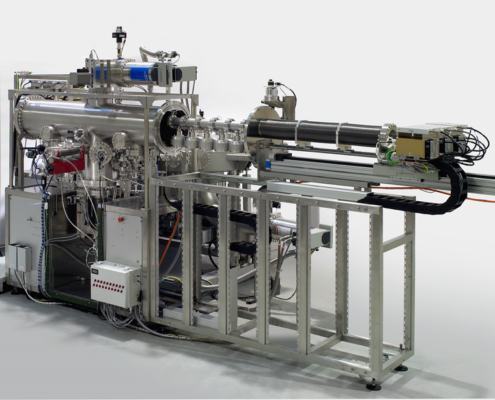 The L400 sputtering system is ideal for combinatorial thin film deposition. Video animation of L400 operation. Video courtesy of Prof. Dr.-Ing Alfred Ludwig, Ruhr-Universität Bochum.